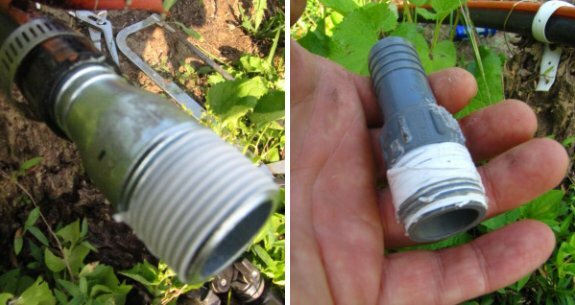 The pressure on our creek pumping irrigation system turns out to be too high for the threads on these plastic connectors. It kept popping off until I wrapped a generous layer of plumber's tape around the threads. That fix lasted a full year before it started popping off again. Fast forward to the end of this story where a metal connector seems to have no problem handling the high pressure. The full metal solution was only 2 dollars compared to 49 cents on the plastic version. One new discovery I made during this trip to the store is that Lowe's will now give a military discount to all active duty, retired, and veterans all year long. 10 percent is nothing to sneeze at. The only proof they need is some sort of government issued card. Glad to hear about Lowe's as I generally carry my draft card that says 4A on it. Is that code different if you're retired instead of Honorable Discharge? USN for 6 yrs. Maybe that's why I'm still working with water. Thanks for your service Vester. That card should do the trick. All I needed was my VA card. I was also in the Navy. I'd be curious to hear what your rate was and if you started off on the East coast or West coast? It is not surprising that the plastic connectors fail over time. 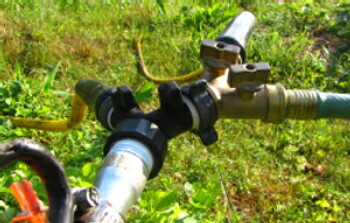 They are meant for the pressure in a municipal water supply, which has around 2 bars of pressure (say 20 meters of head). Well pumps are often much more powerful; Small pumps can overcome 125 feet (38 meters) of head, and you can easily find them with 500 meters of head. The latter is equivalent with around 50 bars of pressure! That was my gut feeling, but I didn't have the knowledge to back it up --- that our high pressure sprinkler system just needed more serious connectors. Especially since I sometimes forget when swapping water from one line to the other and turn one off before turning the other on, rather than vice versa, which results in a buildup of pressure behind the connector while both lines are briefly turned off. MM2 at discharge and was studying for 1st. Was part of Adm. Rickover's Navy - SSN 614.